ViewPoint 3D Ltd was formed in 2010 with the aim of developing photorealistic 3D software for a range of applications, including business presentations, info TV (digital signage), industry, science, education and 3D movie creation. The concept behind ViewPoint 3D is that Presentation and Digital Signage software should be much more advanced, fully 3D, and easier to use. ViewPoint 3D is the first real-time 3D software that offers a more natural and enjoyable way to work by using a virtual 3D world in which to create content. It is relatively quick to learn, and instantly creates stunning 3D animated presentations and content without the need for complex 3D design software or programming. Most of all, ViewPoint 3D works in real-time to produce live data-updated 3D content for any application, and even includes drivers to directly drive the latest glasses-free 3D screens and projectors. We're busy working on a range of ideas for ViewPoint as hardware technology allows, including realistic atmospheric and ocean modeling using data provided by NASA that creates truly stunning photorealistic scenes. ViewPoint isn't focused entirely on 3D screens though, as it is a general purpose 3D software that creates and manages content for 2D screens as well. ViewPoint 3D is an on-going project working with expert developers and industry partners to create an exciting new type of 3D software. If you are interested to see what futuristic presentation and digital signage software could really be like, then please contact us. 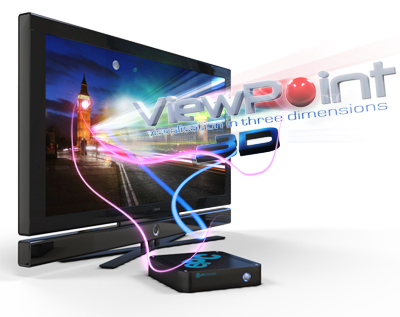 ViewPoint 3D is also available in an OEM version ready for rebranding, and also for embedded products, with a light-weight 3D player for both Windows, Linux and Android. If you are interested to know more about live-data 3D visual communications, please contact me.